Unless you’ve been hiding under a rock for the past few years, you’ve seen the rise of the gluten free phenomenon. I first learned about gluten intolerance when we found out my uncle had celiac disease (an extreme intolerance to gluten). That was about 15 years ago, when the gluten free options were lacking, to say the least. Now, there are so many delicious gluten free products out there, and just as many amazing gluten free recipes. I’ve heard from a number of my gluten free friends that lunch can be the toughest meal to swing. Whether you have a gluten free allergy, are gluten intolerant, or are looking to cut gluten out of your life to feel better, we’ve rounded up 30 gluten free lunch ideas (and snacks) for the whole family! Put simply, gluten is a family of proteins found in grains like wheat, rye and barley. Gluten helps foods maintain their shape, and is found in many foods, some of which you might not expect. Foods that contain gluten include bread, pizza, baked goods, cereal, French fries, pastas, soups, sauces, and even some supplements and medications. It’s hidden in many foods, even ones like soy sauce and condiments, so always make sure to check labels before you buy. What are the Symptoms of a Gluten Allergy? If you notice you have pain, bloating, constipation and/or diarrhea after eating foods with gluten, you could very well have a gluten allergy. If you’re experiencing these problems, take notice of what you recently ate and see if cutting gluten out helps your digestive issues. People who are allergic to gluten often experience brain fog, and are unable to think clearly and perform tasks. People with brain fog often feel tired and may fumble in conversation when they’re normally very well spoken. You could be experiencing brain fog if you’re unable to concentrate, you have problems with attentiveness, you have lapses in short-term memory and experience forgetfulness. You may also experience confusion or disorientation. People with gluten allergies are especially prone to headaches and migraines. You may want to consider keeping a food journal to determine what you’re eating that’s giving you a headache. Write down everything you eat and when you get a migraine. You’ll start to notice trends and can determine whether gluten may be causing your headaches. What are the Symptoms of a Gluten Intolerance? A gluten intolerance is when your body isn’t able to digest or break down gluten. People with intense gluten intolerance, such as those with coeliac disease, develop inflammation and damage in their intestinal tract and other parts of the body. Most people with gluten intolerance experience severe abdominal pain after they consume gluten. One of my roommates in college was gluten intolerant and if she ate any gluten at all she would keel over in pain. Abdominal pain is the most common symptom of a gluten intolerance. You may not think that what you eat can affect you psychologically, but it absolutely can. People with digestive issues, and especially those with celiac disease have been found to have increased depression and anxiety. If you’ve noticed you’re losing weight without trying, you shouldn’t ignore it. Unexplained weight loss is one of the main symptoms of celiac disease and gluten intolerance. This is due to various digestive problems, poor nutrient absorption, and also not eating because you’re scared of being in pain when you do eat. People who are gluten intolerant are very prone to fatigue and tiredness, especially after eating gluten. Gluten intolerance can also cause iron-deficiency anemia, which leads to even more fatigue and a lack of energy. Dermatitis herpetiformis is a skin rash that develops due to an autoimmune reaction to gluten, also known as celiac disease. If you notice really itchy groups of small blisters on your scalp, elbows, knees, back or buttocks, it could mean you have dermatitis herpetiformis from a gluten intolerance. Now that we’ve looked at symptoms of having a gluten allergy or gluten intolerance, take a look at 8 benefits of eliminating gluten from your diet. If you’re thinking of going gluten free and want your family to follow suit, here are 30 gluten free lunch and snack ideas for the whole family! 2. 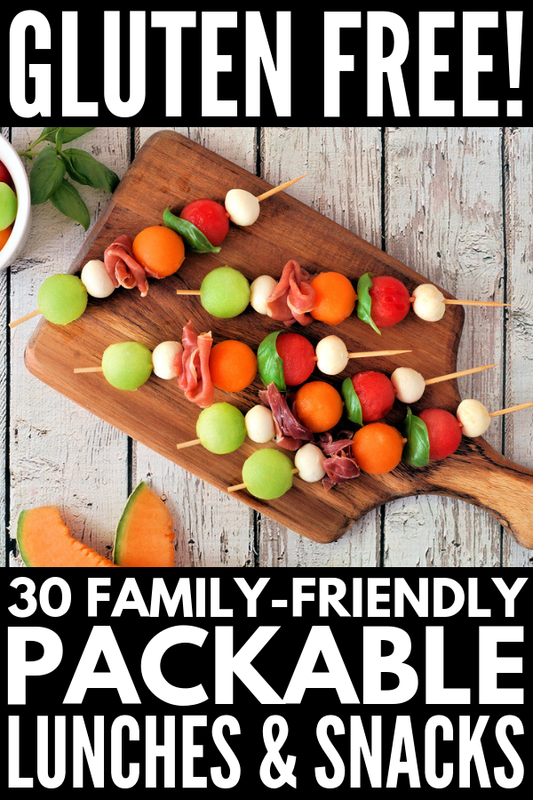 Sandwiches on a Stick | Ingredients Inc.
RELATED: 100 Family-Friendly Gluten-Free Recipes! 10 Gluten Free Snack Ideas Everyone Loves! It’s not hard to live a gluten free lifestyle anymore. If you have a gluten sensitivity or intolerance, or want to go gluten free for other reasons, these recipes will keep you satisfied every day of the week. If you loved these gluten free lunch ideas, please share this post on Pinterest! And if you want more healthy recipes, make sure to follow our Food board on Pinterest!